The most natural and environmentally friendly cosmetics handmade only with us. 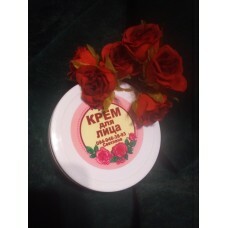 A cream for a dry skin of the face "day time". Day cream with a pleasant and gentle consistency, will provide proper care for dry skin of the face, strengthening and restoring natural protection. It is an excellent foundation for foundation. It does not overload the tender epidermis, making the face supple and soft. Avocado oil Avocado oil - prolongs the youthfulness of the skin, moisturizes dry skin, smooths wrinkles, protects against ultraviolet rays. Cocoa oil Cocoa butter - has vitamins and minerals, struggles with wrinkles and acne, protects in cold weather, gives elasticity to the skin. Essential oil of orange The essential oil of an orange is quite versatile and suitable for all skin types. It perfectly cleanses, tones, improves the appearance of any type of skin. Especially recommended is essential oil of orange in the care of dry, mature, flabby, fading skin. Sesame oil Sesame oil, primarily recommended for the care of dry, coarse, fading and flabby skin of the face. It has a good nutritional, moisturizing, and emollient properties, it prevents dryness of the skin, eliminates its peeling, prevents the appearance of the first signs of aging (wrinkles, lethargy, slackening, decreased tone and elasticity of the skin).